A complete AR15 upper receiver group consists of the receiver, sights (or scope), barrel, muzzle device, gas system and bolt carrier group. For much less than the price of a new rifle, the shooter can have the options of a second one by simply changing the upper receiver. This is characteristic allows the shooter the ability to experiment with different barrel lengths, different sight options or for that matter a different caliber. Most caliber changes made by exchanging the upper receiver assembly are a straightforward affair. A 5.56mm upper receiver is removed and a second in 300 Blackout, 6mm BR, 6.5 Grendel or similar cartridge length caliber is put in its place. The shooter just needs an appropriate magazine to be in business. The top 10 upper receivers for sale are listed below in an easy to read comparison chart. Use this quickly scan and find the one that matches your needs. The image, upper name, the price and rating are listed below so you can easily see the ones that you want. Below you will see the top 3 uppers currently available. Unlike the comparison table above, we have given a review for each upper listed below so that you can learn more about each one. One of the biggest innovations in the development of the AR-15 uppers is the piston driven system. Rather than relying on direct impingement of the gas system, which can leave the rifle dirty after shooting, the piston maximizes the use of hot gasses to cycle the bolt. This addresses many of the concerns of reliability with the platform, but makes the use of a railed forend a necessity to properly dissipate the heat. Adams Arms’ system allows the rifle to run cooler, with less fouling and wear on the action, and makes the rifle easier to maintain. The short-stroke piston shaft allows for smoother feeding, and less perceived recoil. The forged receiver has M4 feed ramp cuts and a 13-slot Picatinny-cut flattop rail. The gas system is adjustable for use with sound suppressors and has a shut-off to allow single shot fire with no cycling if needed. The interior of the bore and the externals are coated in Melonite for superior wear and corrosion resistance. 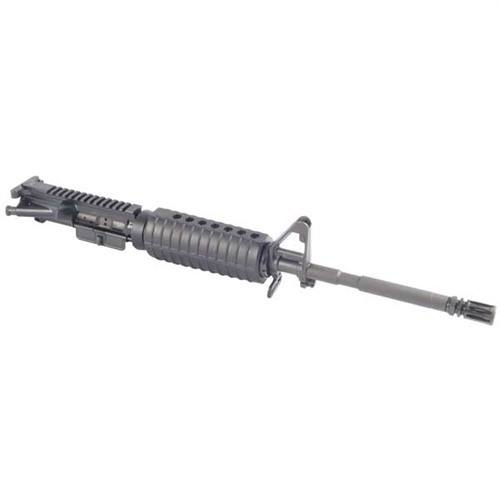 For the best value and variety in direct impingement upper receiver assemblies, it is hard to beat DPMS. 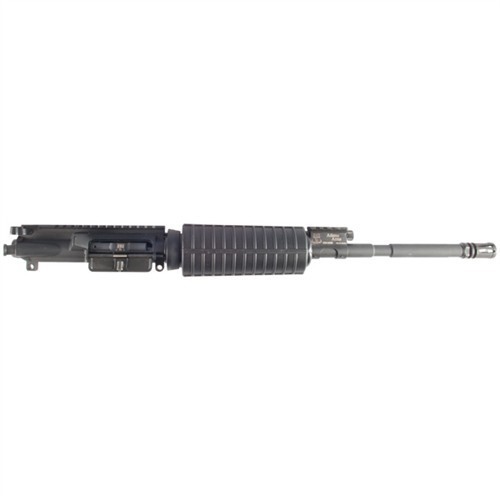 These are forged and their barrels utilize a six-groove, 1-9″ right-hand twist rate and have M4-type feed ramps installed for increased reliability. The standard and M4 profile barrels are chambered in 5.56mm NATO and are crowned with an A2-style flash suppressor. The bull barrels, on the other hand are constructed from stainless steel and are chambered in 223 Remington with a low-profile Picatinny gas block and aluminum free-float hand guards. DPMS is under the umbrella of the Freedom Group family of companies and the quality control behind their designs make their value-priced uppers one of the best buys when it comes to selecting upper receivers. Some of their Oracle models feature an Advanced Armament Corporation (AAC) BREAKOUT style flash suppressor to allow the ease of using an AAC quick detach (QD) sound suppressor. Spike’s Tactical offers a good selection uppers designed to meet and exceed the standards of the US Military. The barrels are of the M4 profile with feed ramps and are chambered in 5.56 NATO. The chamber and bore are hard chrome plated to increase corrosion resistance. Part of Spike’s rigorous manufacturing and testing process includes magnetic particle inspection (MPI). This testing ensures that the barrel is free of surface cracks and flaws by applying a magnetic field from an external source in order to detect discontinuity in the metal surfaces of the barrel. The top of the receiver and the bolt are laser etched with Spike’s logo of a camel spider and the T (top) markings on the rail are etched in a similar manner for quick replacement of optics and other accessories. For a complete do-it-yourself build, you may not need a complete upper receiver in order to install a unique barrel, rail system, etc. In that case you want the best quality for the price and need look no further than Aero Precision. 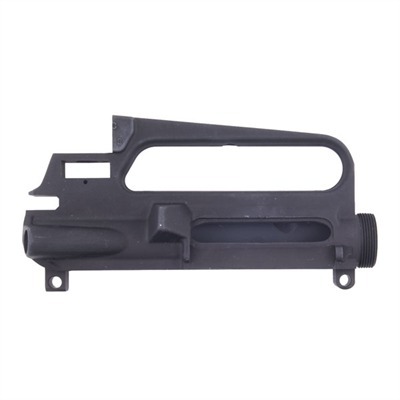 These upper receivers are constructed from 7075 aircraft aluminum for superior strength and are anodized in a Type-3 finish for superior resistance to the elements. The top rail features laser-engraved T-marks and an American flag. These have M4-type feed cuts to allow the use of a true M4 style barrel to ensure reliable feeding and can be had without the forward assist and ejection port if that is what your build calls for. In some cases the AR-15 rifle’s lower may be a dedicated NFA (National Firearms Act) item as either a machine gun or a short barreled rifle. This means that the owner has paid a $200 transfer tax with the Bureau of Alcohol, Tobacco, Firearms and Explosives to own such a rifle. In the case of an NFA item, the shooter can use any type of AR15 upper receivers with a barrel length below 16”. An assortment of upper assemblies is usually maintained by owners of full automatic AR15 rifles as the wear of full automatic fire is rough on not only the AR-15’s receiver, but on the barrel, bore and bolt as well. Since the lower of an AR15 rifle is the part that contains the serial number, it is considered a firearm and must be transferred through an FFL (Federal Firearms License) holder. The complete upper receiver of an AR15 rifle is considered to be in essence, just another part. They can be delivered to the buyer’s address with no paperwork or background checks in most jurisdictions, although some cities and states have passed laws banning the transfer of what they incorrectly consider to be “machine gun parts”. The interchangeable system of complete upper receivers quite literally gives the AR15 owner the best of all worlds. In a matter of minutes calibers can be converted from 22lr to the mighty 50 BMG and most points in between. A long range varmint rifle can become a short range close quarter combat weapon by the pushing of two steel pins. Mounted red dot sights or night vision scopes can replace hunting optics as easily as a piston driven upper receiver can replace a gas impingement one. 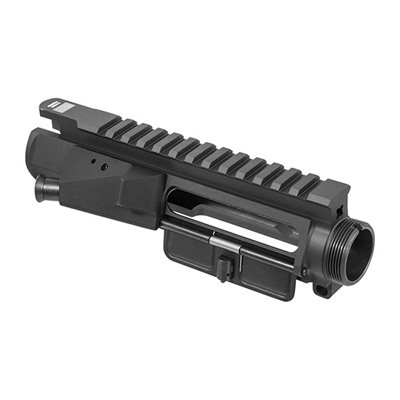 If you are looking for a new lower, then check out our AR15 lower receiver page!